You can activate this card when your opponent activates a Spell Card. If your opponent cannot immediately discard 1 Spell Card from his/her hand, negate the activation of the Spell Card and destroy it. 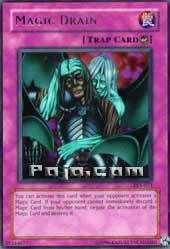 Magic Drain is a card that's been played fairly frequently since its initial release in Pharaoh's Servant. It's been generally accepted as the best Spell negator after Imperial Order, which would, then, make it #1 post-ban. But is that really the case? The arguments in favor of Magic Drain claim that you more or less always win when you use it. Either you get to negate your opponent's Spell Card for free, or your opponent discard another Spell Card, giving you some sort of card advantage. Card advantage, however, isn't quite as important post-ban; therefore, Magic Drain doesn’t instantly become the best. The fact that negation isn’t guaranteed also hurts it a little. Obviously, waiting until late-game to use Magic Drain is a better tactic; you'll have a better chance of guaranteed negation, since your opponent's hand size is likely to be smaller. Negating things also becomes more crucial as the game progresses. Basically, Magic Drain is a card that you don't want to use if you need reliable protection for your Spells or Traps. It IS a card that you want to use if you want to annoy and potentially disrupt your opponent, so it can really fit into almost any deck. This is, next to Imperial Order, the best negation out there. Magic Jammer is frowned upon because you're giving up 2 cards for their 1 -- Jammer + the discard against their single Magic. Magic Drain gives a bit less control, but puts that advantage in your favor. You give up one card for a free stop of one (better than Jammer) or a Spell from their hand. Reducing their hand size is always good. True Control players may have ran this alongside their Drop Offs/Time Seals. Although Imperial Order is getting banned in Advanced Format, it's worth mentioning these two worked well together (that is until MST becomes Restricted...BAH @ KONAMI.) A player sets Imperial and Magic Drain. Other player plays Harpie's Feather Duster/Heavy Storm. You Imperial. They MST Imperial. You flip Drain. In order for them to get anything else through that turn, they have to give up a -THIRD SPELL-. Most of the time, that third spell won't be worth it or they won't have a third spell in hand, which allows the player to continue their Imperial lock. Watch for this to get played in Advanced Format with IO gone. Players may have a few extra spots in their Deck they don't know what to do with, and in the Trap lineup, this is a likely candidate. Rated For: Any Deck. Any Deck. Any Deck. I love Magic Drain. It was one of my favorite cards even before the ban list was released; the removal of Imperial Order makes this card’s playability skyrocket. It’s the `only playable form of spell negation left; that makes its value priceless. Advantage F/H: Most people mistake the true value of Magic Drain (which explains all the Magic Jammer vs. Magic Drain arguments). The point is this: either your opponent chooses to let his spell sputter, giving up his chance to take over the game, or negates the spell, limiting his options even further. It’s almost like Magic Drain is a deep pit sucking up your opponent’s resources; he can try to dig his way out, but he’ll just fall in deeper. Either you’re trading Magic Drain for the best spell in his deck, or you’re trading it for two spells in his hand. Win-win for you, lose-lose for them. 9/10. Best Draw for the Situation: Drawing this card when you’re being beat-down by an attack force is just horrid. Let’s hope that your deck possesses enough power and versatility to always have some sort of field presence to protect with this card, otherwise it’ll be useless. 7/10. Attributes/Effect: Pre-ban, this card cut down some of the most effective and feared cards in the game. Post-ban, it does the same, negating the card advantage of Pot of Greed, making the cost for Premature Burial even steeper, equalizing the burden of Heavy Storm, and so on and so forth. Decks running NO spell negation pre-ban were suicidal, and in post-ban play, spell negation will still be important. 8/10. Dependability: If you’re looking to stop the spell for certain, this card isn’t your cup of tea. However, I hope you understand by now that, whether your opponent chooses to discard or not, he’s still put in a rather tough situation. And you should like that. 8/10. The Bottom Line: Please stop overlooking it now. Play it, you’ll be surprised. Cards it functions well with: It’s a one card wrecking crew.